Duff McKagan is currently putting the finishing touches on a solo album. 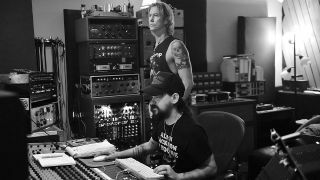 The Guns N’ Roses bassist has been at Station House studios in Echo Park, California, working on the record with producer Shooter Jennings, with the album said to be a musical follow-up McKagan’s 2015 book, How To Be A Man (And Other Illusions). Duff says: “I wrote a couple of articles about historical places I passed through on this last tour and people kept asking if that was going to be the focus of my next book. Jennings adds: “From the first night we sat together at my piano hashing out arrangements of his songs, before going into the studio to record them, I felt it was a really important record that had to be heard. No firm release date has been revealed, but the as-yet-untitled album is expected to launch at some point in 2019.